July 16, 2018 at 7:39 pm. 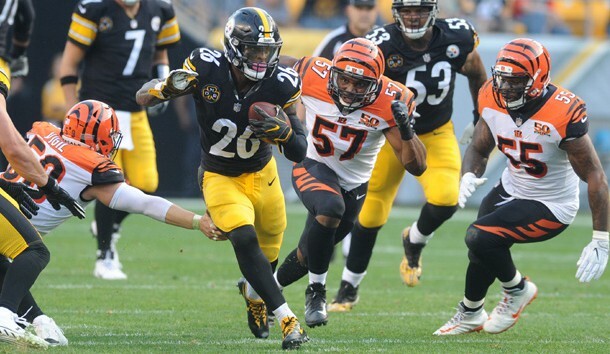 None of the four players who received a franchise tag got a long-term deal completed by Monday afternoon’s deadline, and the agent for Pittsburgh Steelers running back Le’Veon Bell said it probably means Bell will not be a Steeler in 2019. Los Angeles Rams safety Lamarcus Joyner, Dallas Cowboys defensive end DeMarcus Lawrence and Detroit Lions defensive end Ezekiel Ansah also will play under the franchise tag. However, those three were expected to fall short in their quest for long-term deals. The only question heading into Monday was Bell, and his agent confirmed Monday afternoon that Bell will play under the franchise tag again. The Steelers released a statement saying they will revisit a long-term deal for Bell after the 2018 season. The 26-year-old Bell is set to make $14.5 million this season under the franchise tag. He will become a free agent after this season. Joyner did not come to terms on a contract extension with the Rams, so the fifth-year pro will play the 2018 season for $11.287 million under the franchise tag. The Cowboys’ Lawrence will make $17.143 million under the franchise tag after failing to reach a long-term extension with the team. Ansah will also play under the franchise tag for the Lions in Matt Patricia’s first season as head coach. Ansah, who had 12 sacks last year, will make $17.1 million this season. –First-round draft pick Roquan Smith is not expected to be in attendance when Chicago Bears rookies report to training camp. Smith, who was the eighth overall pick of the 2018 NFL Draft, hasn’t signed his rookie contract and is steering clear of the team until a deal is done, NFL Network Insider Ian Rapoport reported. –The Baltimore Ravens placed guard Marshal Yanda on the physically unable to perform (PUP) list for the start of training camp, ESPN reported. Yanda, 33, suffered a fractured his left ankle in 2017, ending his season after two games. He made six consecutive Pro Bowls from 2011 through 2016 and was twice named All-Pro. Yanda will not practice with the team until the Ravens activate him. –The New York Jets announced on their website that they released wide receiver Devin Smith and signed safety Brandon Bryant. Smith has been ravaged by injury since being selected by the Jets with a second-round pick in the 2015 NFL Draft. The 26-year-old fractured his ribs on the second day of training camp in his rookie season and sustained a torn ACL later in the year. He also missed all of last season after he suffered the same knee injury in April. Smith, who did not participate in spring practices this year, collected 10 receptions for 135 yards and a touchdown in 14 career games. Bryant was not selected during last Wednesday’s supplemental draft. He played 37 games for Mississippi State before applying for the supplemental draft because he was declared academically ineligible for 2018. –Cornerback Sam Beal agreed to a four-year rookie deal with the New York Giants, the team announced. Beal was selected in the third round of last Wednesday’s supplemental draft. He was projected as an early pick in the 2019 draft before being declared academically ineligible at Western Michigan and leaving school. The Giants had to give up their third-round pick in the 2019 draft to take Beal in the supplemental draft. –Green Bay Packers quarterback Aaron Rodgers is willing to put the past behind him in relation to the hit administered by Minnesota Vikings linebacker Anthony Barr that broke his collarbone. “I mean, I think it’s time to move on for everybody,” the 34-year-old Rodgers told Peter King in the debut of Football Morning in America. Rodgers told television host Conan O’Brien last year that cameras missed Barr giving him the finger and another derogatory gesture while the two-time NFL Most Valuable Player was on the ground during that Oct. 15 game. Barr, however, told a significantly different story. “After the play, I go back to the huddle, don’t even look or say a word to him,” the 26-year-old Barr wrote on Twitter in October. “Once he gets up I’m waiting for the play call, and hear someone shouting all kinds of profanities. I look over and it’s (Rodgers) calling me all kinds of names, (expletive) you this, (expletive) you that as he’s walking off the field. –Rodgers turns 35 in December, but he is not ready to consider retirement. “I’d love to play to 40 (years old),” Rodgers told NBC Sports’ Peter King. “I just think that number means a lot. Obviously, Tom (Brady) is kind of rewriting the book. Brett (Favre) had a good season when he turned 40. My goal is, be able to move like I do or close to how I do and still be able to do that at 40 … just because nobody’s been able to do that and still move around the same. –Tennessee Titans offseason acquisition Malcolm Butler sees plenty of similarities between new coach Mike Vrabel and Bill Belichick. Butler spent eight years playing for Belichick before joining Vrabel and the Titans on a five-year, $61 million contract. That deal came to pass a little over a month after the 28-year-old Butler was effectively benched during Super Bowl LII. “It’s the Patriots system, one of the greatest systems in the NFL,” Butler said, via SI.com. “You can tell Mike played for Belichick because you can see some of the similarities. They’re about winning the way New England is about winning. –San Francisco 49ers cornerback Richard Sherman didn’t hold back when addressing his seven seasons with the Seattle Seahawks. Sherman helped the Seahawks win a Super Bowl title after the 2013 season and led the club back to the championship game the following year. Then, according to the four-time Pro Bowl selection, it started to go south in the Pacific Northwest. “Mistakes and poor judgment on things ruined what could have been a really special deal,” the 30-year-old Sherman told Sports Illustrated . “You don’t have much left right now. –Former New York Giants coach Ben McAdoo claimed he’s “at peace” with the decision that led to the unceremonious end of Eli Manning’s consecutive games streak. A backlash from the team’s fanbase ensued Nov. 28 shortly after Geno Smith was announced as the team’s starter for the Dec. 3 game versus Oakland, thereby ending Manning’s streak at 210 consecutive games. –Quarterback A.J. McCarron isn’t just thinking about his first season with the Buffalo Bills. He’s also thinking about life after football. “Eventually, I want to get into racing,” the 27-year-old McCarron said Saturday at his annual football camp in Mobile, Ala., via AL.com. McCarron plans to begin with the small circuits before working his way up, he said. –New England Patriots linebacker Elandon Roberts is taking better health to heart. Roberts hosted his second annual heart walk on Sunday at Memorial High School in Port Arthur, Texas. The event is held in the memory of Roberts’ aunt, Felicia Carrier-Christian, who passed away from heart disease. She was 42. –Arizona Cardinals rookie quarterback Josh Rosen noted his concerns with the NCAA last year, and he continues to make his thoughts known on the subject. Rosen would like athletes to profit from money-making opportunities during their college careers, such as allowing their names and likenesses to be used on cards and jerseys. The money would be set aside, and the athlete could collect it after he graduates.